Just how important is it to use lightfast colored pencils? There have always been discussions about lightfast colors among serious artists. Artists who create work for sale want their work to last beyond years or decades. They want it to last generations. So do the collectors who spend big bucks to get original artwork. When considering lightfastness in colored pencils, what number is considered light fast? Is there any difference in the lightfastness of oil pencils in relationship to wax based pencils? Do I have to use lightfast colored pencils? Let’s take a look at each of these questions individually. If a color does fade over time, it’s also referred to as fugitive. The color “runs away and hides” if exposed to light. Sometimes it may disappear altogether, and sometimes very quickly. Most companies that produce art supplies for fine art or professional use test their products to see how they hold up under use. That includes tests for fading and durability, among other things. Oil paints have included lightfast information for many years. Most reputable colored pencil manufacturers also now include such information on each pencil. This basic information is designed to let artists know which colors are lightfast and how lightfast they are. Pencils are rated differently in the US than in Europe and other parts of the world, but all brands are tested in some form, and many companies provide color charts that include lightfast ratings. Prismacolor pencils are made by a US-based company, so they’re tested according to US standards. The ASTM D6901 standard, to be precise. Any color with a I ranking is said to be very lightfast. Colors with a V ranking are very poor. My personal sunlight tests show such colors fade within weeks when exposed to direct sunlight. Unfortunately, the rating is not printed on the pencils. Faber-Castell Polychromos pencils are made in Germany and are tested using the Blue Wool Scale, which is the European standard. The results are divided into eight categories, with the lowest numbers being the most likely to fade. To further complicate matters, Faber-Castell and other companies combine categories into three. They rate their pencils on a star system. A color with one star is more likely to fade than two- or three-star colors. So the answer to this question depends on the pencils you use and where they’re made. Look for high numbers in non-US made pencils and low numbers in US-made pencils. So it doesn’t matter whether you use wax-based pencils (with a primarily wax binder) or oil-based pencils (with a primarily oil binder.) If the pigment fades, then it will fade regardless. What makes the difference is that some companies replace fading pigments with more expensive pigments that are similar in color, but do not fade or don’t fade as quickly. Those pencils are more expensive because the pigment itself is more costly. Not because of the binder used in making the pencil. No. You do not have to use lightfast colored pencils all of the time, or for every drawing. You don’t have to use them at all, if you really don’t want to. Nor do you have to remove every fading color from your new set of pencils if you don’t want to. A lot of those fading colors can’t currently be replaced in any brand. Pinks and purples are notorious for fading, but if you really need to use them in your work, then you should use them. So is there any time or place for using lightfast pencils? You can safely use fading colors if you don’t plan to sell the original. If it’s a practice piece, just for fun, or if you sell reproductions and keep the originals, it’s perfectly safe to use fading colors. If you do give those pieces away (or even sell them,) make absolutely sure the new owners fully understand the precautions they need to take. What are those precautions? Be aware of the interior lighting in the exhibit area, since some artificial lighting can also contain ultra-violet light. If you’re doing craft work (gift cards, etc.,) adult coloring books, or anything else of that nature, you don’t really need lightfast colors. Even so, it is important to know enough about lightfast ratings to understand how they work and why they’re important. That’s the best way by far to avoid potential problems. Today, I want to share some of the colored pencil blending tools I use most often. If you’ve been following this blog for any length of time, you may have read about some of these in different posts. But a recent reader question prompts me now to talk about them in a single post. That reader asked about my favorite blending tools. Yes, of all the colored pencil blending tools available and all those I’ve used, I do have a few that I reach for repeatedly. So I’ll tell what they are and why I like them so much. Pencil blending is what you do when you layer one color over another. Dry blending is any method of blending that happens after you’ve layered color, and that doesn’t involve solvent. Colorless blenders, blending stumps, and scraps of paper fall into this category. Solvent blending is any blending method that requires a solvent. The solvent could be odorless mineral spirits, turpentine*, rubbing alcohol*, or rubber cement thinner*. Anything that dissolves the binder in colored pencil can be put into the solvent blending category. *Links to articles on EmptyEasel. I’ll list at least one in each of these three categories, and tell you not only why I like it, but how and when I use it. The pencils themselves are my blending tool of choice. I use them every time I draw. I love layering color and that’s the easiest—and most easily used—method of blending colored pencils on the market today. You don’t need smelly solvents (or any other kind.) You don’t need special tools or materials. Just pencils and paper. Whenever I draw, I’m blending, whether I’m adding more layers of the same color to make darker values, or adding other colors to make new colors, it’s all blending. Colored pencils are also great for burnishing, which is a form of blending in which you press down as hard as you can on the paper. But the best part is that they require no additional storage containers or special treatment! A good, stiff bristle brush is also an excellent tool for blending colored pencils. Whenever you blend with solvent, you need a brush, and I get the best results with bristle brushes because I can use a little more pressure. Well-worn bristle brushes are my absolute favorite. These two are just a couple from a jar full of worn out oil painting brushes I’ve kept on a shelf for years. TIP: If you happen to have old oil painting brushes lying around, don’t throw them away. Wash and rinse them thoroughly, let them dry, then put them in your colored pencil toolbox! Yes, bristle brushes are perfect for blending with solvent, but that’s not my favorite way of using them. When you draw sanded pastel paper (which I highly recommend you try at least once,) you create a lot of pigment dust. You can sweep that dust into the trash if you want, but there’s a much better option. Blend it into the tooth of the paper with a bristle brush. The results can be quite pleasing. Granted, this method of blending works best on sanded papers. For regular drawing paper, my favorite dry blending tool is what’s known as colorless blenders or blending pencils. Prismacolor colorless blenders are shown below, but many other brands also have blending pencils. Colorless blenders are pencils without the pigment. Prismacolor colorless blenders are a wax-binder core. Lyra’s Splender Blender is an oil-based blending pencil. But in both cases, you can blend with them without putting additional color on the paper. You can use any brand of blender on any brand of pencils. Lyra’s Splender Blender is oil-based and I used it on Prismacolor pencils until I used it up. It worked fine. But in most cases, the blenders do work best on the pencils for which they were designed. I don’t really have a single favorite tool for blending with solvents other than my trusty bristle brush and a sable or two, so let me share my favorite solvent. As I write this, I have Gamsol Odorless Mineral Spirits on my drawing table. I also have a small jar of rubbing alcohol. Both blend colored pencils quite well, though the Gamsol does produce a more thorough blend. It’s difficult to say which I like better, since they’re suited for different types of blending. Gamsol, for example, works on Stonehenge, Canson Mi-Teintes, watercolor paper (but not with watercolor pencils,) and sanded art paper. So those are my favorite colored pencil blending tools. Do I use other tools to blend colored pencils? Absolutely! Paper towel and bath tissue are great for soft blends on smooth papers like Bristol or Stonehenge. Sable brushes work quite well with solvents when I can blend an area without exerting a lot of pressure. Don’t tell anybody, but I even sometimes use a finger tip, which is not recommended because of skin oils. And there are many blending tools I’ve never tried. But that, my friend, is an topic of another day! Can You Oil Paint Over Colored Pencil? Colored pencils are ideal for mixed media work of all types, but can you use oil paint over colored pencil? If you’ve been following this blog for any length of time, you know I’ve experimented with combining colored pencils and a number of different mediums, including watercolor, India ink, and graphite. But what about oil paints? Will that work? As a former oil painter, I admit the question is intriguing. Think how much more quickly you could finish a piece if you could paint over colored pencil (or use colored pencil over oil paint.) The possibilities seem endless. And on the surface, it does seem like oil paints and colored pencils should work well together. Especially if your colored pencils are oil-based. But Can You Oil Paint Over Colored Pencil? Back in my oil painting days, I tried adding details to oil paintings with colored pencils. I wanted a way to paint things like long hair, stitching in leather, and tiny highlights that was better than oil painting, and didn’t need to dry. Colored pencils looked like the answer, but I didn’t care for the results. The surface of the paint wasn’t smooth enough even in the super smooth areas. I just couldn’t get very fine details. What’s more, none of the colors I tried would stick to the slick surface of dry oil paint. I couldn’t even make a decent mark! It would be my guess that oil paint wouldn’t stick to colored pencils very well, either. You might have better results if you’re using oil-based colored pencils, but even then, I wouldn’t guarantee the archival qualities of such a combination. There is also the problem of the oils in oil paints discoloring the paper you’re drawing on. And unless you draw on a surface like canvas or gessoed paper, you run the risk of having the oils in oil paints damage or destroy the paper over time. So I don’t recommend using oil paints and colored pencils together in any way. If you just want to do something fun and different, then go ahead. But if you’re hoping to make something that will stand the test of time, then it’s probably better not to mix oil paints and colored pencils. The best way to find out if you can use colored pencils under oil paint is to do a test painting on the paper you want to use. It doesn’t need to be a detailed painting. Just layer colored pencil on the paper, then stroke a little paint over it. How well did the oil paint dry? Did it soak through the paper, even through heavy layers of colored pencil? Does the paint stick to the colored pencil, or does it flake off? Is the paper (or the colored pencils) discolored in any way? Did the paint dry lighter or darker than it looked wet? Did it fade at all in comparison to the colored pencil? For the best results, be prepared to keep the test painting for up to a year, since some of these issues may take that long to appear. I did a couple of tests on my own, one on Canson Mi-Teintes pastel paper, and another on Canson L’Aquarelle watercolor paper. The colored pencil portion of this experimental drawing was put down with heavy pressure. All I wanted was a lot of pigment on the paper. I used Prismacolor because they’re wax-based and would be a good test of how well oil paints stick. I added oil paint by spattering, and with a brush. Some of the paint is on top of colored pencil, but I also painted over bare paper. The paint dried surprisingly quickly, probably due to the absorbent nature of the paper, so that wasn’t the problem I expected. However, the oil binder in the paint did soak through the paper, even through the colored pencil. The spattered color didn’t soak through as much, but there are a few stains on the back of the paper. The brushed-on paint, however, did soak through. The staining would be more pronounced had I thinned the paint with a medium or solvent. I also wanted to see how well the paint stuck to the colored pencil. Answer? Not at all. I couldn’t scratch oil paint off the paper, but it came right off the colored pencil. Part of the reason for that is that scratching also removed some of the colored pencil. Will the paint flake off on its own over time? That’s possible. The next test was on 140lb watercolor paper. Since watercolor paper is made for wet media, it seemed like it should work with oil paint, too. I spattered and washed watercolor pencil over the paper, then let that dry and dry brushed the tree. As with the first test, I used paint straight out of the tube, without solvent or painting medium. Again, the paint dried more quickly than expected. Also as before, there was staining on the back, but it was very faint and only where I’d used the most paint. I’m not sure you’ll be able to see it in the illustration below. I had to look very closely to see it in real life. The biggest difference between the two papers was that I couldn’t scratch oil paint off the colored pencil or the paper. Not even where the paint was the heaviest. No matter how hard I tried. Is the paint sticking better to the watercolor pencil or the watercolor paper or both? I can’t answer that without conducting more tests. Nor can I say whether or not there will be more damage as time passes. The results may very well end up being the same as with the Canson Mi-Teintes, but just take longer to appear. Can you use oil paint over colored pencil? You can, if you exercise care in choosing paper and layering color. Would I do it on a portrait or exhibit piece? No. But the decision is yours. As I mentioned above, it’s always worthwhile to experiment on your own, using your own supplies and methods to see what happens. Let’s talk about those necessary accessories that help us get the most out of our pencils: colored pencil sharpeners and erasers. There are lots of sharpeners and erasers on the market. I haven’t used all of them, or even most of them, so the best I can do is tell you the which sharpeners and erasers I’ve used and what I thought of them. What is your favorite sharpener for colored pencils? Of all the sharpeners I’ve used, I’m not sure I have a favorite. All of them have worked well for some applications, and haven’t worked at all for others. I haven’t found a sharpener that works great for everything. The first sharpeners I ever used were hand-held sharpeners. You know the kind. They’re a dollar or less at your favorite super store or grocery store, they come in bright colors, and are made of plastic. Sometimes they come with a container to hold shavings; sometimes they don’t. My first sharpeners didn’t have a container for shavings, so I had to carry one. Usually a small, empty wide-mouth jar. The sharpeners were usually small enough to fit into the wide-mouth jar. Back then, they worked extremely well. Prismacolor pencils were still made with a solid wood casing that could withstand sharpening without breaking or cracking. I never once considered a different sharpener, especially since I was doing a lot of work out of the studio. Usually at horse shows. The bonus was that if I happened lose or break a sharpener, it was no big deal. I just went and bought another! I currently use an old-fashioned crank sharpener by Apsco. The kind that used to be in every classroom in every public school. I like this sharpener because it’s solid, is designed to take pencils of different sizes, and it sharpens like a dream. It’s easy to clean, too. Just turn the shaving container a quarter turn, slide it off the blades, and empty it. To keep the blades sharp and functioning properly, I sharpen lead pencils once in a while to remove wax and other colored pencil debris. A few years ago, I had a battery operated, which made it ideal for working away from the studio. I used that Stanley Bostitch Model BPS10 everywhere. It fit into the laptop carrier I used to tote art supplies, and it was quiet enough to use almost anywhere I wanted to draw. It used four AA batteries and had a good-sized, easy-to-empty shavings tray. Amazingly, it is still available for only $10.99 directly from Bostitch. I also used a Panasonic Auto-Stop KP-310. The power cord was long enough to also make this compact sharpener good for drawing away from home if I was going to be in a place with access to electricity. It sharpened extremely well, and had an auto-stop function, so it didn’t sharpen pencils beyond an ideal point. But perhaps the best thing about this sharpener was the suction cup feet on the bottom. They kept the sharpener from moving backward when I used it. No need to steady the sharpener with one hand. This sharpener is no longer available new, but I did find several listings at Amazon and eBay. If you’re looking for a good, reliable, and inexpensive electric sharpener, this is a good place to begin. What is the best eraser for colored pencils? There isn’t a good eraser for colored pencils. 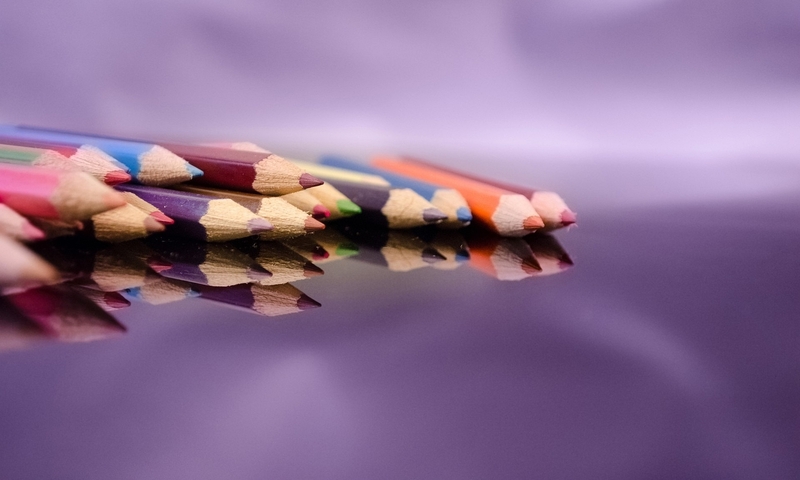 Colored pencils are either wax-based or oil-based, so most “normal erasers” tend to smear the color around rather than remove it. Some companies make colored pencils that can be erased, but these are not recommended for fine art use, or for any art you want to last. However, if you use them for sketching, you can use almost any standard eraser on them. Here are some erasers I’ve tried…. for better or worse. What I refer to as click erasers are similar to mechanical pencils. The eraser is a long, round “tube” and fits into a plastic, pencil-like holder. The eraser is “advanced” by clicking a mechanism at the top of the barrel, hence my name for them. Here are my click erasers. The lighter blue one is a Pentel Clic Eraser ZE22. The darker pencil is a very old Faber-Castell Jet Eraser. Refills come in various hardnesses. It’s helpful to have more than one eraser, each with a different hardness of eraser refill. These erasers are stiff enough to sharpen with a blade if you want to make a very fine point. You can also shape them with an emery board or sand paper. Kneaded erasers are pliable, which means you can shape them into various forms, roll them into points, or tear off pieces for small work. I’ve used kneaded erasers, but they’re better suited to graphite than colored pencil. They work wonders for graphite, but aren’t very effective for colored pencils. My husband has a couple of old electric erasers that work extremely well with my colored pencils. He worked on one drawing that I thought was hopeless and was able to remove enough color to allow me to finish the drawing. I’ve used them once or twice myself, but confess that I’m not comfortable with them. There’s just too much risk of scuffing the paper. They could be extremely useful with enough practice, but I work with such a light drawing hand that I see no reason to spend the time to get proficient with an electric eraser. If you’re more daring with electric tools, you might try an electric eraser, though. A lot of colored pencil artists swear by them. When I really want to remove color, I don’t reach for an eraser. Instead, I use mounting putty (shown below,) or transparent tape. Mounting putty is a lot like a kneaded eraser, but it’s sticky enough to remove wax- or oil-based colored pencils. You can’t lift all of the color, but you’ll be able to remove enough to work over it. The real beauty of mounting putty is that you can shape it, clean it by kneading it, and reuse it for a long time. Transparent tape is very good at lifting color, and it’s very easy to use. Just tear off a piece, press it lightly to the color you want to lighten, and lift carefully. The only real disadvantages to using tape to erase is that you can tear the paper if you’re not careful, and it can leave the paper feeling a little bit slick. My suggestion is to use it as a last resort, and use it sparingly. For tips on using mounting putty and tape, read 2 Neat Tricks for Erasing or “Lifting” Color from Colored Pencil Drawings on EmptyEasel. There you have it. My favorite colored pencil sharpeners and erasers. As I said before, these aren’t the only sharpeners and erasers available, but they are the ones with which I have experience. They may be ideal for you, but if not, I at least hope I’ve given you a good place to begin looking!